I still remember when my Thai friend asked me “Kadek, which part of Bali do you like the most ?” Without hesitation i said, I love Batur Volcano since this area offer the different angle of Bali with the highland windy breeze and beautiful view along the way. Some people might only know that Bali is popular by its beach life with a lot of surfers coming every year looking for the good waves. But forget about those hustle bustle South Bali area, let’s take a look to what north Bali can offer. All the travel agents claim that sunrise in the top of Batur Volcano is the best sunrise in Bali. With only 2 hours walking distance from the base camp to the peak, this outdoor activity becoming popular among travelers. From my honest opinion, I don’t resist that sunrise in the top of Batur volcano is the best sunrise in Bali I’ve been through, in the position I never try the highest one Mount Agung volcano. But, comparing with the time spent which is 6 hours apart, Batur volcano win in every angle. It needs 2 hours driving from Seminyak, Kuta, and Canggu area to reach the base camp, and 1 hour driving from Ubud. People usually depart at midnight and start trekking at 03.00 am with approximately arrive at 05.30-06.00 am. The sunrise itself start at 06.00 am. There would be a local little shop selling a glass of coffee and hot tea at the peak. I highly recommend to take different track for going back down as you’ll see different angle of the Batur Volcano. So many travel agents provide the tour package including the breakfast at the peak. Those prices are that I found mostly at some travel agents. 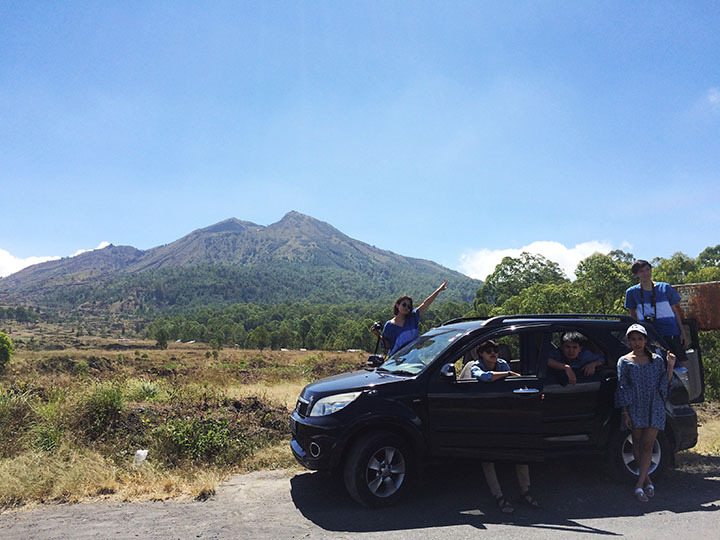 For travelers who don’t like the outdoor activity, enjoying the Batur volcano view by taking the road trip could be an option. It’s better if you can stay in Ubud, so you just need 1 hour drive to reach the highland area. The weather at the foot of Batur volcano would be totally different, it’s so windy and fresh. You might open your window seat to feel the breeze. How To get There : You can go with scooter and car. Hire a scooter cost 60.000/24 hrs and car around 650.000-750.000 including driver and petrol. The best time to come here is around 09.00 – 11.00 am as the sky is still blue and the fog has not go down yet. They have 2 standard pools and one infinity hot spring pond in the side of Mount Batur Volcano. How To get There : You can go with scooter and car. Hire a scooter cost 60.000/24 hrs and car around 650.000-750.000 including driver and petrol. Drive toward the Lake Batur, and follow the sign heading to Toya Devasya Hot spring. After relaxing in the hot spring, get the late lunch with Batur volcano view. There are so many restaurants in the main road of this area. I just randomly chose one restaurant which that time no one was there. Surprisingly, for me, they have such a perfect Mount Batur view and the foods are also good. The name of restaurant is Warung Baling – Baling. They sell Indonesian food. This could be my one of the best cultural experience. In a remote bay on the shores of Lake Batur lays the isolated ancient of Bali Aga Village. People of Bali Aga Village renowned for its unique mortuarial rites where body are not buried but left to rot out open. The island where those corpses laid located separately with the main land of people. Trunyan itself is the name of the tree which is believed has the good smell to cover the smell of dead. What you will see there are a pile of skulls in the root of the trees. Have you ever visited Batur Volcano area ? do you have any good stories ? Let’s share in the comment below.